This is an essential post for Dynamics CRM Online customers as you will be transitioning to Dynamics 365 soon! Microsoft has ceased to transact Microsoft Dynamics CRM from 1.11.16 and has moved to Dynamics 365. So where has Microsoft Dynamics CRM gone? The first thing to remember is that Microsoft has moved the functionality of CRM to Dynamics 365 and whilst there are differences, by planning your transition you can make this as seamless as possible for your end users. You can transition to Dynamics 365 now, or whenever you choose up to the contract agreement renewal time. Alternatively, you can renew your contract between 1.11.16 and 1.2.17 and enter a new 12 month CRM By renewing your contract in this way would mean that you would have a further 12 months before transitioning to a D365 plan, however if your contract falls into renewal post 1.2.17, you may need to transition to Dynamics 365 then. At renewal there will be a concessionary transition price. To get the transition pricing you must have been active on Microsoft Dynamics CRM Online prior to 1.11.16. License transitions will need to be planned. With Dynamics 365 the focus is on plans and applications; really using the role based licensing. With Dynamics CRM there were 3 license types, professional, basic and essential. Microsoft Social Engagement (MSE) is included with Dynamics 365 for Sales, Customer Service, Field Service and Project Service. MSE will not be available to purchase on its own as an application. It will be included within each of the Dynamics 365 Enterprise plans and the enterprise Plan 1 business applications. The full functionality of MSE will be available in Dynamics 365 sales, customer service, field service and project service automation, or in the plan licensing. Unified Service Desk is included with Dynamics 365 for Sales, Customer Service, however the unified service desk is not available as a standalone application. Please note that Dynamics Marketing, Microsoft Parature and Marketing Sales collaboration will not be part of Dynamics 365 service, however these products will still be supported by Microsoft. 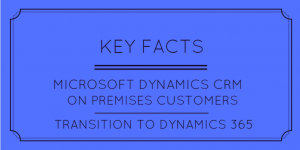 So these are the Microsoft Dynamics 365 Key Facts for CRM Online customers, however if you need support or want to discsuss your options further, please contact us. For Microsoft Dynamics CRM SPLA customers (for example, those hosting with Caltech IT Limited), we await further information regarding any transition to Dynamics 365. Please check back here for more information in forthcoming months. Are you a CRM On Premises customer transitioning to Dynamics 365? Check out our blog.